Last Sunday on August 18th, filmmaker Roman Polanski celebrated his 80th birthday, a huge milestone for the controversial and talented creator of such works as “Chinatown”, “Rosemary’s Baby”, and “The Pianist”. Today, I thought we’d take a look at his second full length feature, the highly influential and disturbing “Repulsion“, a shocking examination of a young woman’s slow descent into madness. Carol (Catherine Deneuve) is a shy, quiet eighteen year-old French girl who lives in a small London apartment next to a nunnery with her older sister Helen (Yvonne Furneaux). She has a seemingly normal, simple life, working in a beauty salon by day giving manicures to rich older ladies, at night retiring back to her apartment, where she is turned off by her sister’s obnoxious boyfriend Michael (Ian Hendry) and their loud sexual activities. Carol’s own boyfriend Colin (John Fraser) is a little nicer, but she flinches from his touch and stands him up on dates. She walks the streets of London in a stupor, wandering by car accidents in an oblivious haze and staring transfixed at cracks in the pavement, cracks that she soon starts noticing in her apartment. After Helen and Michael go to Italy on vacation, she is left alone in the apartment to fend for herself, and here the movie starts to increase the tension, as Carol mental condition becomes more and more deteriorated. Beset by mysterious phone calls, clanging church bells, odd noises, and violent hallucinations, she becomes enveloped in paranoia and frightening psychosis, and completely withdraws from society. Food rots in the kitchen, cracks appear in the walls, and at night she has horrific visions of being raped by a strange man. As her friends, boyfriend and landlord start to worry about her, they visit the apartment leading to a shocking and disturbing third act as her insanity completely takes over. Since almost 80% of “Repulsion“ takes place inside of a single apartment, one word used to describe this film would be claustrophobic. Polanski puts the camera right in her face for many shots, and we feel the suffocating presence of her madness as the walls (sometimes literally) start to creep in. Even in later scenes, when the apartment seems to be morphing and expanding, our viewpoint is right behind her head, as if to emphasize the distance between our objective, and her subjective, reality. Deneuve is utterly captivating as the tormented Carol, expressing with innocent eyes wide-eyed horror at her terrifying visions in one scene, and a chilling emptiness in the next. The major theme here appears to be sexual fear and paranoia, as Carol is repulsed by any male advances or contact and lashes out violently in response (it is hinted at that she may have been sexually abused as a child, though Polanski refuses to admit it in a DVD interview extra). 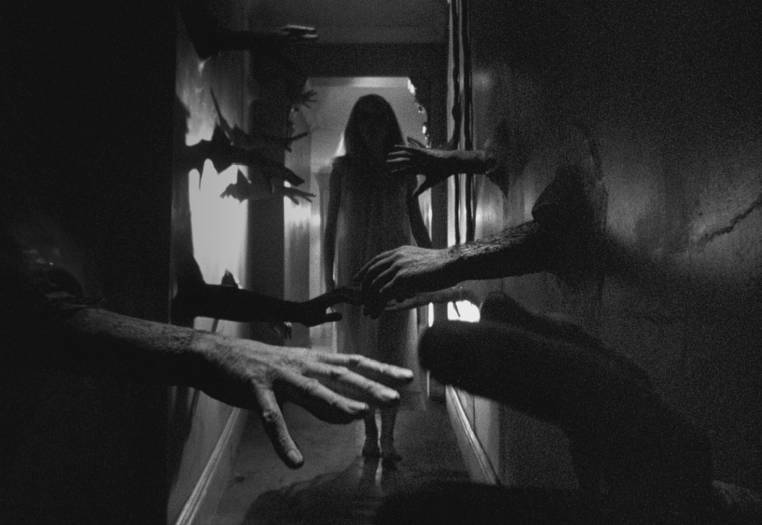 Credit for delivering this creepy atmosphere must also be given to the late cinematographer Gilbert Taylor, who Polanski hand-picked after seeing his excellent use of shadows and light play in “Dr. Strangelove” (and who would later go on to work on “Star Wars“). 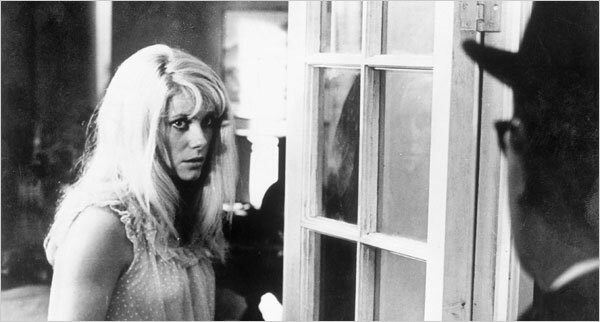 “Repulsion” is simply one of the best psychological thrillers (or horror films) I’ve seen in a long time. It is disturbing, dark and almost unbearably tense at times, especially considering that it was made in Britain, notorious for their harsh censorship laws. It is also highly influential on later films. David Lynch owes a lot to this film, specifically “Eraserhead”, and the voyeuristic madness of “Blue Velvet”. Also, the peeling wallpaper and creaking pipes of the Coen brothers’ “Barton Fink“ and the sexual chaos of Michael Haneke’s “The Piano Teacher” seem to owe a huge debt to Polanski and “Repulsion”. The Criterion one disc DVD is relatively light on extras, including director commentaries and an episode of a French television show that shows us rare behind the scenes footage of the filming of the movie. Also included is a brief documentary on the film, interviewing Polanski and the producers, where we find out such interesting tidbits as how the prop man procured large sheets of rubber from the local Durex condom factory for the hallway special effects scene. Deneuve is so haunting and it is amazing how much emotion she conveys without barely saying a word.